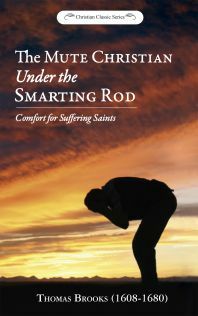 Here is a tremendous feast of biblical encouragement for the weary Christian. Believers in Jesus Christ do suffer, but the Lord has provided abundant consolation in His Word for their help. Sometimes quaint but always memorable, Brooks will point you to the Lord Himself for your refreshment and help! 32 pages. "The Lord is in his Holy Temple—let all the earth keep silence before him." Hab. 2.20. The Epistle Dedicatory—To all afflicted and distressed, dissatisfied, disturbed, and agitated Christians throughout the world. Dear hearts—The choicest saints are 'born to troubles as the sparks fly upwards', Job 5:7. 'Many are the afflictions of the righteous: but the Lord delivers him out of them all.' Psalm 34:19. If they were many, and not troubles, then, as it is in the proverb, the more the merrier; or if they were troubles and not many, then the fewer the better. But God, who is infinite in wisdom and matchless in goodness, has ordered troubles, yes, many troubles to come trooping in upon us on every side. As our mercies—so our crosses seldom come single; they usually come treading one upon the heels of another; they are like April showers, no sooner is one over but another comes. And yet, Christians, it is mercy, it is rich mercy, that every affliction is not an execution, that every correction is not a damnation. The higher the waters rise, the nearer Noah's ark was lifted up to heaven; the more your afflictions are increased, the more your heart shall be raised heavenward. First, The afflicting hand of God has been hard upon myself, and upon my dearest relations in this world, and upon many of my precious Christian friends, whom I much love and honor in the Lord, which put me upon studying of the mind of God in that scripture that I have made the subject-matter of this following discourse. Luther could not understand some Psalms until he was afflicted; the Christ-cross is no letter in the book, and yet, says he, it has taught one more than all the letters in the book. Afflictions are a golden key by which the Lord opens the rich treasure of his word to his people's souls; and this in some measure, through grace, my soul has experienced. When Samson had found honey, he gave some to his father and mother to eat, Judges 14:9, 10; some honey I have found in my following text; and therefore I may not, I cannot be such a churl as not to give them some of my honey to taste, who have drunk deep of my gall and wormwood. Augustine observes on that, Ps. 66:16, 'Come and hear, all you that fear God, and I will declare what he has done for my soul.' 'He does not call them', says he, 'to acquaint them with speculations, how wide the earth is, how far the heavens are stretched out, what the number of the stars is, or what is the course of the sun; but come and I will tell you the wonders of his grace, the faithfulness of his promises, the riches of his mercy to my soul'. Gracious experiences are to be communicated. 'We learn—that we may teach'—is a proverb among the Rabbis. And I do therefore 'lay in and lay up,' says the heathen, that I may draw forth again and lay out for the good of many. When God has dealt bountifully with us, others should reap some noble good by us. The family, the town, the city, the country, where a man lives, should fare the better for his faring well. Our mercies and experiences should be as a running spring at our doors, which is not only for our own use—but also for our neighbors', yes, and for strangers too. Secondly, What is written is permanent and spreads itself further by far—for time, place, and people—than the voice can reach. The pen is an artificial tongue; it speaks as well to absent as to present friends; it speaks to those who far off as well as those who are near; it speaks to many thousands at once; it speaks not only to the present age but also to succeeding ages. The pen is a kind of image of eternity; it will make a man live when he is dead, Heb. 11:1. Though 'the prophets do not live for ever', yet their labors may, Zech. 1:6. A man's writings may preach when he can not, when he may not, and when by reason of bodily distempers, he dares not; yes, and that which is more, when he is not. Fourthly, Its marvelous suitableness and usefulness under these great turns and changes that have passed upon us. As every wise husbandman observes the fittest seasons to sow his seed—some he sows in the autumn and some in the spring of the year, some in a dry season and some in a wet, some in a moist clay and some in a sandy dry ground, Isaiah 28:25; so every spiritual husbandman must observe the fittest times to sow his spiritual seed in. He has heavenly seed by him for all occasions and seasons, for spring and fall; for all grounds, heads, and hearts. Now whether the seed sown in the following treatise be not suitable to the times and seasons wherein we are cast, is left to the judgment of the prudent reader to determine; if the author had thought otherwise, this babe had been stifled in the womb. Fifthly, The good acceptance that my other weak labors have found. God has blessed them—not only to the conviction, the edification, confirmation, and consolation of many—but also to the conversion of many, Rom. 15:21. God is a free agent to work by what hand he pleases; and sometimes he takes pleasure to do great things by weak means, that 'no flesh may glory in his presence.' God will not 'despise the day of small things;' and who or what are you, that dare despise that day? The Spirit breathes upon whose preaching and writing he pleases, and all prospers according as that wind blows, John 3:8. Sixthly, That all afflicted and distressed Christians may have a proper salve for every sore, a proper remedy against every disease, at hand. As every good man, so every good book is not fit to be the afflicted man's companion; but this is. Here he may see his face, his head, his hand, his heart, his ways, his works; here he may see all his diseases discovered, and proper remedies proposed and applied. Here he may find arguments to silence him, and means to quiet him, when it is at worst with him. In every storm here he may find a tree to shelter him; and in every danger, here he may find a city of refuge to secure him; and in every difficulty, here he may have a light to guide him; and in every peril, here he may find a shield to defend him; and in every distress, here he may find a cordial to strengthen him; and in every trouble, here he may find a staff to support him. Seventhly, To satisfy some bosom friends, some faithful friends. Man is made to be a friend, and apt for friendly offices. He who is not friendly is not worthy to have a friend; and he who has a friend, and does not show himself friendly, is not worthy to be accounted a man. Friendship is a kind of life, without which there is no comfort of a man's life. Christian friendship ties such a knot that great Alexander cannot cut. Summer friends I value not—but winter friends are worth their weight in gold; and who can deny such anything, especially in these days, wherein real, faithful, constant friends are so rare to be found? 1 Sam. 22:1-3. The friendship of most men in these days is like Jonah's gourd, now very promising and flourishing, and anon fading and withering; it is like some plants in the water, which have broad leaves on the surface of the water—but scarce any root at all; their friendship is like melons, cold within, hot without; their expressions are high—but their affections are low; they speak much—but do little. As drums, and trumpets, and flags in a battle make a great noise and a fine show—but do nothing; so these friends will compliment highly and handsomely, speak plausibly, and promise lustily, and yet have neither a hand nor heart to do anything cordially or faithfully. From such friends it is a mercy to be delivered, and therefore king Antigonus was used to pray to God that he would protect him from his friends; and when one of his council asked him why he prayed so, he returned this answer, Every man will shun and defend himself against his professed enemies—but from our professed or pretended friends, of whom few are faithful, none can safe-guard himself—but has need of protection from heaven. But for all this, there are some that are real friends, faithful friends, active friends, winter friends, bosom friends, fast friends; and for their sakes, especially those among them that have been long, very long, under the smarting rod, and in the fiery furnace, and that have been often poured from vessel to vessel—have I once more appeared in print to the world. Eighthly and lastly, There are not any authors or author come to my hand, who have handled this subject as I have done; and therefore I do not know but it may be the more grateful and acceptable to the world; and if by this essay others that are more able shall be provoked to do more worthily upon this subject, I shall therein rejoice, 1 Thess. 1:7, 8, 1 Cor. 9:1, 2. I shall only add, that though much of the following matter was preached upon the Lord's chastening visitations of my dear yoke-fellow, myself, and some other friends—yet there are many things of special concernment in the following tract, that yet I have not upon any accounts communicated to the world. And thus I have given you a true and faithful account of the reasons that have prevailed with me to publish this treatise to the work, and to dedicate it to yourselves. First, Read and look up for a blessing—'Paul may plant, and Apollos may water,' but all will be to no purpose, except 'the Lord gives the increase,' 1 Cor. 3:6, 7. God must do the deed, when all is done, or else all that is done will do you no good. If you would have this work successful and effectual, you must look off from man—and look up to God, who alone can make it a blessing to you. As without a blessing from heaven, your clothes cannot warm you, nor your food nourish you, nor medicine cure you, nor friends comfort you, Micah 6:14; so without a blessing from heaven, without the precious breathings and influences of the Spirit, what here is written will do you no good, it will not turn to your account in the day of Christ; therefore cast an eye heavenwards, Haggai 1:6. It is Seneca's observation, that the husbandmen in Egypt never look up to heaven for rain in the time of drought—but look after the overflowing of the banks of Nile, as the only cause of their plenty. Ah, how many are there in these days, who, when they go to read a book, never look up, never look after the rain of God's blessing—but only look to the river Nile; they only look to the wit, the learning, the arts, the parts, the eloquence, etc., of the author, they never look so high as heaven; and hence it comes to pass, that though these read much, yet they profit little. Thirdly, Read, and test what you read; take nothing upon trust—but all upon trial, as those 'noble Bereans' did, Acts 17:to, 11. You will try and count and weigh gold, though it be handed to you by your fathers; and so should you all those heavenly truths that are handed to you by your spiritual fathers. I hope upon trial you will find nothing—but what will hold weight in the balance of the sanctuary; and though all be not gold that glitters, yet I judge that you will find nothing here to blister, that will not be found upon trial to be true gold. Sixthly, and lastly, Read and pray. He who makes not conscience of praying over what he reads, will find little sweetness or profit in his reading. No man makes such earnings of his reading, as he who prays over what he reads. Luther professes that he profited more in the knowledge of the Scriptures by prayer, in a short space, than by study in a longer. As John by weeping got the sealed book open, so certainly men would gain much more than they do by reading good men's works, if they would but pray more over what they read! Ah, Christians! pray before you read, and pray after you read, that all may be blessed and sanctified to you; when you have done reading, usually close up thus—So let me live, so let me die, that I may live eternally. And when you are in the mount for yourselves, bear him upon your hearts, who is willing to 'spend and be spend' for your sakes, for your souls, 2 Cor. 12:15. Oh! pray for me, that I may more and more be under the rich influences and glorious pourings out of the Spirit; that I may 'be an able minister of the New Testament—not of the letter—but of the Spirit,' 2 Cor. 3:6; that I may always find an everlasting spring and an overflowing fountain within me, which may always make me faithful, constant, and abundant in the work of the Lord; and that I may live daily under those inward teachings of the Spirit, which may enable me to speak from the heart to the heart, from the conscience to the conscience, and from experience to experience; that I may be a 'burning and a shining light,' that everlasting arms may be still under me; that while I live, I may be serviceable to his glory and his people's good; that no discouragements may discourage one in my work; and that when my work is done, I may give up my account with joy and not with grief. I shall follow these poor labors with my weak prayers, that they may contribute much to your internal and eternal welfare.